PRE-ISO-CAT-I-ENG This training has been designed for predictive maintenance based in vibration inspectors in order to follow recommended procedures for vibration data collection. Monday 10:30 – 13:30 – 15:00-18:00. Tuesday to Thursday: 09:00 – 13:30 – 15:00-18:00. Friday: 09:00 – 11:00 Exam 11:00 – 13:00. Public or on-site course conducted by an experienced, certified Mobius Institute instructor. The course follows 150 1836-2:2003 and A5NT 5NT-TC-1A Recommended Practice for training and certification of Category I or Level I vibration analysts. This course includes a 400+ page Course Manual, Quick Reference Guide, Mobius mouse pad with fault diagnostic reminders and pen. Examinations for certification are offered as an option at the end of the course. All Mobius certified analysts receive personalized logos with their certification number and name for their own professional use. Mobius Institute also maintains a listing of all certified analysts on mobiusinstitute.com and provides each analyst with a personal webpage. If you have been performing vibration analysis for less than one year, or if you have been collecting vibration readings and leaving the analysis to another person, then this course is for you. This course is also designed for reliability engineers, PdM program managers, and other maintenance staff who would like to understand condition monitoring with a focus on vibration analysis, and take the 150 or A5NT exam. Duration: 4 days Cat 1/ Level I, Optional: Review & Certification Examination, 2 hours, 75% Passing Grade The Vibration Analysis Cat I course is intended for personnel who are new to vibration monitoring and analysis, and for personnel who have limited vibration analysis experience. The course focuses on periodic, single channel data collection and analysis for condition based maintenance programs. A foundation is established for in-depth understanding of spectrum and waveform relationships. This is the ideal starting place for new vibration analysts, people collecting vibration data, and those who want a better understanding of vibration analysis and condition monitoring. You will come away from this course with a very good understanding of the fundamentals; you will understand how to take good measurements (and understand the importance of repeatability); and you will be ready to begin analyzing vibration spectra. We can support you with your trip and hotel reservation. Zaragoza is located close to Madrid and Barcelona, so you can reach Zaragoza in around one hour and a half from these cities. Also Zaragoza is connected by plane with London and Brussels. This 4 day course, including review and the exam, is the ideal starting place for new vibration analysts, people collecting vibration data, and those who want a better understanding of vibration analysis and condition monitoring. The course exceeds the 150 18436-2 Category I standard and meets A5NT 5NT-TC-1A Recommended Practice. The 2 hour optional certification exam can be taken after the course. Are you ready to get started in vibration analysis and condition monitoring? You will enjoy this course! 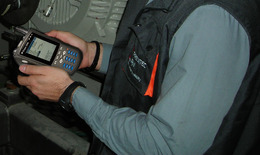 You will come away with a solid understanding of why we monitor the condition of rotating machinery (and other critical assets), the importance of improved reliability, and how the vibration can be successfully measured and analyzed to provide an early warning of a wide range of fault conditions. You won't come away as an expert; that's what our more advanced courses are for. But you will know enough to make a valuable contribution to an existing program; be in a position to start a new program; determine if you should implement a program at your site; or better understand the program that exists in your plant. Mobius makes learning about vibration analysis unique. We use 3D animations, Flash simulations, and numerous software simulators that completely demystify vibration analysis. While vibration training courses have traditionally been very theoretical, difficult to understand, (and boring), you will be captivated by the Mobius Training methods, and you will enjoy our practical approach. You will take away skills that you can immediately apply to your job, and you will truly understand what you are doing. When senior vibration analysts attend our classes they often say "if only I could have learned this way when I got started" - well, now you can! Registered students are given access to the online version of the course via the Mobius Institute Learning Zone before the class and for six months after course completion to assist them with converting the course information into practice. Our focus is on practical knowledge and understanding of machine knowledge, faults and how to recognize problems in time to plan for an outage and act before catastrophic failure or collateral damage occurs. For the Hands-on version of the course, two modules will be assigned to be completed online prior to attending the class (Maintenance Practices and Condition Monitoring). These will be reviewed on the first day. On the fourth day of the course, we work with everyone to practice the correct and safe use of the data collector (yours or ours), how to locate data collection points, and attach and detach the sensors. We discuss why it's important to verify that the machine is running at its normal speed and load and why it's important to talk to shop floor personnel about any changes in the machine's sound or operation. We also cover how to verify that good data has been collected for analysis. First you are taught why we perform vibration analysis, and how it fits into the maintenance plan. We also emphasize the benefits of condition based maintenance and a reliability centered approach. What is breakdown maintenance and when should it be employed? What is preventive (calendar based) maintenance, and what are its major flaws? What is predictive (condition based) maintenance, and what are its benefits? What is proactive (reliability centered) maintenance, and what are its benefits? We use a Flash simulator that demonstrates the relationship between "infant mortality", breakdown modes, and common maintenance practicesyou may be surprised about what you will learn about preventive maintenance. Next we summarize vibration analysis and describe five other technologies that can be utilized to determine the health of rotating machinery, and other key assets such as switchgear, insulators, compressed air systems, and others. These topics are summarized in order to give the attendee a working knowledge of each technology. What can it tell you about rotating machinery? How to you detect leaks and electrical faults? How can it be used to detect bearing faults? We use a simulator to demonstrate visually and audibly how acoustic emission tests are performed. How can it be used to detect faults in mechanical and electrical equipment? What is emissivity, and how does it affect the accuracy of the measurements? What are the key qualities of thermal imaging cameras? In addition to lots of thermal images, we have a number of Flash simulations that clarify the effect of emissivity and environmental conditions on the test results. How can you test if the lubricant is "fit for purpose"? What do viscosity, cleanliness, particle count, and other tests tell you? How can you learn about the nature of wear? How can you determine which components are wearing? How does it differ from conventional oil analysis? What are the most common types of faults? What can motor current analysis tell you? What other test types tell you about the condition of the rotor, stator, and insulation? We use a number of samples of real data, and an excellent simulator that demonstrates the limitations of the overall level meter (that follows ISO standards). You won't believe your ears! Now we get into the details of understanding vibration terminology and basic theory. This is the first time that the simulators will make a huge difference to your understanding of the topics covered. You will see exactly where the waveform comes from, how the spectrum is created, and why machines generate different frequencies. What is the time waveform? What is frequency and period? What are rms, peak and peak-peak? What happens when the vibration includes multiple frequencies and amplitudes? We use a great simulator to demonstrate where the waveform comes from. We utilize a virtual dial indicator and a strip-chart recorder. You will never wonder what a waveform is again. We use a fantastic simulator that totally demystifies the spectrum. The spectrum and waveforms are shown in an interactive, 3D simulation. We get our biggest"ah, ha!" moments here. Using units of orders instead of Hz or CPM. We utilize a couple of great simulators that are used to illustrate how to calculate forcing frequencies. In one case, you drag and drop machine icons to calculate all of the frequencies from the machine. What is the difference between acceleration, velocity and displacement? When would you use each type of unit? How to convert between each type of unit? We have two simulators that demonstrate the relationship between these three parameters. One demonstrates a car and the change in displacement, velocity and acceleration as it is driven in different ways. And the second simulator shows how the displacement, velocity and acceleration change with frequency. What is phase (in-phase, out of phase, phase angle)? Why is it important in vibration analysis? How is it measured with a single-channel analyzer, two-channel analyzer, and strobe? While our simple phase simulator provides a clear demonstration of the phase difference between two fans, the simulator that demonstrates phase measurement collection is incredibly popular. You can drag the optical tachometer onto a virtual machine, and then move the sensor on the machine to see the phase readings. It can also demonstrate two-channel and strobe measurements. You have to see it to believe it. The next major topic covered is data acquisition. A vibration analysis program will fail unless the vibration readings are collected correctly. They must be collected from the correct location on the machine, and they must be collected the same way each and every time - and that includes the operating conditions of the machine (speed and load). The Category I vibration analyst should not be the person who decides how the analyzer should be set up, nor should she/he decide where the measurements should be taken. However, given that some programs do not have a Category II analyst available, (and it is always important for every vibration analyst to understand these issues), we do discuss these important points in this section of the course. Many of the recommendations for measurement locations, analyzer setups and more come from the ISO standards and the Mobius Recommended Practice. Just wait until you see the 3D animations of the accelerometers, velocity sensors, and proximity probes. Do you really need to measure in three axes? What does one axis tell you that another will not? What do you do if you cannot access the desired measurement point? Where is position "1" on the machine? What are "routes" and how do you create them? Why should you record your field observations when you are in the field (and why should you listen to the vibration during data collection)? This section will take you through a quick tour of the operation of your data collector/analyzer, explaining some of the terms you will encounter. The analyzer requires settings to be established for your measurements such as the type and number of averages, the window type, the Fmax limit, the low frequency high pass filter setting, and the lines of resolution. This section is not intended to make you an expert; just make you aware of the importance of each setting, and how they will each impact the measurement quality. The importance of selecting the correct Fmax and lines of resolution? What does averaging do, and why is it important? You will see a number of simulators that make this potentially complicated topic very easy to understand. Instead of using overly technical terms and boring slides, the simulators demonstrate exactly what these settings do, and why they are so important. You get to see and hear the vibration, and see the final spectra - with correct and incorrect settings. Now we get into the spectrum analysis process (we will also mention the benefits of enveloping, time waveform and phase analysis, but you have to wait until Category II before you learn more about those methods). In this section you will learn how the spectra can be displayed to determine if a fault condition exists. We discuss a number of the most common fault conditions, all supported with excellent 3D animations that demonstrate how the components move when the condition exists. After this section is complete you should feel very confident that spectrum analysis can be used to detect these faults, and you will have greater confidence in your ability to utilize spectrum analysis. Our resonance movies and simulator will open your eyes to the hidden threat that lives in everyone of your machines and structures. Just wait until you see the 3D animations, and the software simulators of the bearings and gearbox. You will understand exactly why the fault conditions exist. The special Mobius Institute pen, mouse pad, and pocket reference guide will help you to remember all of the rules in the future. One of the keys to a successful vibration analysis programs is the establishment of good alarm limits. In truth, very few programs have good alarm limits ... In this section we explain how the band alarm and envelope (mask) alarm systems work, and how you can establish the limits. It is not the job of the Category I analyst to establish alarm limits, but it is important to understand the challenges involved, and the important, of setting good alarm limits. Using the machine modeler simulator, you will see how the envelope alarms and band alarms can be established on any machine that you can describe.